The smart GPS solution. The Navman iCN 520's enhanced features enable you to program in multiple destinations, specify points of interest on route, such as petrol stations, car parks and resaurants, and download additional country maps.Add top quality Global Positioning System (GPS) capabilities to your vehicle without paying a premium price. Navman iCN 520 has been discontinued. Accessories, spares and parts are still available for your iCN 520. The Navman iCN 520 is an easy-to-use, affordable and portable in-Car Navigation (iCN) GPS solution with advanced navigation features and user-friendly interface in a lightweight, portable, contemporary design. The Navman iCN 520 is based on the award-winning Navmn iCN 510, voted Auto Express Best Buy 2005 and best-selling transferable navigation product in UK and France (GFK Market Research Institute April 2005) and comes with enhanced features. ‣High resolution 3.5-inch anti-glare TFT touch screen LCD Display with 65,000 colours. The Navman iCN 520 has been designed to be Plug & Play, and as such can be transferred from vehicle to vehicle with ease by the user. The Navman iCN 520 is powered with a 12-volt adaptor cable in-car. The provided mains A/C power adaptor allows for use in the home or office, when configuring a route (cables included). The Navman iCN 520 works with Tele Atlas Maps to provide detailed maps of the UK. Tele Atlas Maps provide high quality, detail rich maps, which in addition to street information include features such as route calculation, Points of Interest, Estimated Time of Arrival, and more. Further Navman iCN 520 maps are available SD card which insert directly into the Navman iCN 520. Available Navman iCN 520 maps include, Western Europe, North America, Australia and New Zealand. 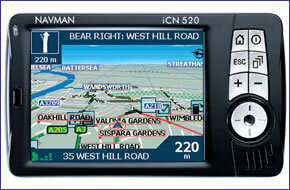 View the complete range of maps available for the Navman iCN 520. Although the Navman iCN 520 has been discontinued, a number of accessories are still available to buy from ActiveGPS. These accessories and spares include: black protective case, windscreen mounting bracket, remote control and external GPS antenna. Answer: Maps issued in 2006 (using 2005 TeleAtlas map data) would be the last available version for the Navman iCN 520. We have sold out of these maps many years ago. You could try eBay to find someone selling either a second hand Navman iCN 520 with UK maps or a seller with old Australia, New Zealand, etc maps? For the latest range of 2019 sat navs please see: https://www.activegps.co.uk/car-sat-nav.htm. Question: I'm trying to obtain a mains pin-type charger for my discontinued Navman iCN 520. Can you help me find one or can you find out the charger voltage (12V?) and amperage? I understand that the iCN 520 does not charge via the USB connection? Answer: Sorry, we have no stock of any car or AC charger for the iCN 520 - so we cannot confirm voltages. Most satnavs need a power supply of around 5volts with amperage varying from 1.2A-2A - but we honestly cannot remember the exact power requirements for the iCN 520. USB connections often result in the device waiting for a software download, hence no power supply. The Navman iCN 520 instruction manual may assist you; you can view it online here. Question: Do you stock a mains charger for navman icn 520 that has pin connector? Answer: The majority of Navman iCN 520 accessories have been discontinued, the mains charger was one of those parts. To view the current range of Navman iCN 520 accessories click here. Do you have a question about the Navman iCN 520? Submit your question via our contact page.